There are some crazy monsters out there. It's hard to choose the creepiest one that is lurking throughout different cultures out there. We get creeped out when we think of the South American vampire reptiles called Chupacabras. Then there are the Australian drop bears, created by Australians to create fear in the heart of tourists. They are basically huge koalas with fangs that sup on tourists who just want to see a real life kangaroo. And let's not forget the Banshee, an ethereal old woman who screams outside homes in Ireland when there's about to be a death. Here's the thing, there might be centuries monsters that have already been integrated into folklore but there are just as many waiting to be created out there. All you need is a little creativity, a combination of creepy animal aspects, and a good story and a monster has been made. Seems easy enough! Why select a full-mask when you can make yourself completely unsettling through your forehead alone? This flexible mask piece simply sticks to your head, giving you the many-eyed look of an arachnid creature. What you pair this mask with is up to you. Throw on a spider costume or get creative and create a completely different look with the rest of our macabre costumes. 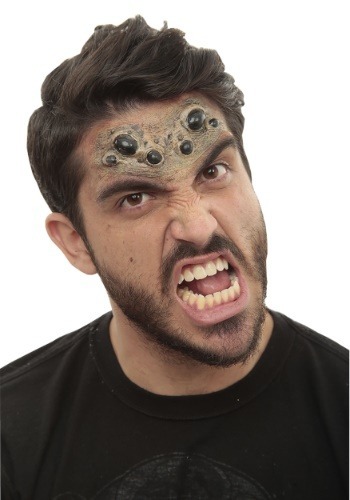 You'll love creating this monstrous look, it's sure to get a second, startled glance from Halloween revelers. Perfect for both Halloween parties and horror houses, your look is sure to spread shock and awe. We thought it was about time that a new monster arrived on the scene!